Over the past few years I’ve been lucky enough to dive with some amazing animals. I’ve rubbed shoulders with whale sharks, tigers, hammers, reefs, blues, bamboos, horn sharks, dogsharks, catsharks; the list goes on. But one group that really gets my blood pumping are those flat cousins of sharks that most divers don’t even notice as they swim along chasing the big guys over the reef. Last fall I was diving off Cabo Pulmo, In the Sea of Cortez. We dropped into a huge bait ball of tuna that were being fed on by a large California sea lion. Tunnels would open through the massive school as the sea lion swept through picking off slow witted stragglers. It was like a National Geographic Special and we floated along transfixed by the action until I saw it. Far below the school, protruding from the otherwise featureless terrain was the slender tail of a diamond stingray. Immediately I was filled with angst. National Geographic Special in one direction, small, innocuous, camera shy stingray in the other. No contest. I gave one last sweeping glance at the action packed scene before me, flipped around, and sank to the seabed, camera strobes blazing. Thirty seconds later the ray had taken off and there I was, too far away to kick back to the bait ball but, elated by my 4 or 5 mediocre frames of the stingray bolting from this crazed diver. My wife is very understanding. Put us down on a pristine Indonesian reef bristling with soft corals and vibrantly colored tropical fish, and she knows that within minutes we’ll be finning over monochromatic sand and rubble on the off chance that there might be an elusive ray lurking under the substrate. Occasionally she points out a nudibranch or a beautiful lionfish in the hope that just maybe, there are other things down there that I would appreciate; and I do, really, but through my eyes nothing compares to a graceful stingray taking flight, or the majestic soaring of a spotted eagleray. They don’t call them eaglerays for nothing. 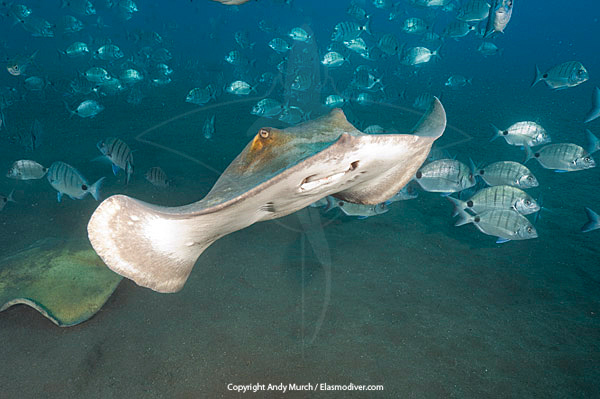 People who know I like to dive with rays ask me if they’re dangerous. “Well” I reply “You could get gummed pretty badly by a hungry Southern stingray. I came away from a dive at Stingray City with some very nasty hickies. And I nearly ran out of air once after spending more than two hours photographing electric rays in a bay in Carriacou”. The truth is that sure you could get stabbed by a stingray barb although divers never do, and yep you might even get juiced by an angry torpedo ray which would be a bad time to find out you’ve got a weak heart. But, there’s really none of the adrenaline rush you get from diving with big sharks. However, to me the beauty of these creatures belies any need for that kind of ‘fix’ or rush. Many rays have incredible markings intricate enough to put the finest tapestry makers to shame, and the fluid movements of even the drabbest species are a sight to behold, let alone a whole flock of rays blocking out the sun as they glide by. Locating rays is not always easy. It’s amazing that an animal possessing a 6ft wingspan can flap its pectorals a couple of times and deposit enough sand on its body to render itself all but invisible with just its eyes and spiracles showing. Those enlarged spiracles are important tools for sucking in water to oxygenate the gills when its mouth is pressed against the ground, allowing it to remain virtually motionless. And, so well designed are the stingray’s eyes that its U shaped pupils are able to judge distance whilst looking in different directions. Couple this with the ability to swim backwards and a venomous tail barb or two, and you’ve got a defense system worthy of NATO. Not a bad thing when many of your free swimming relatives would like to have you for lunch. So, the next time you’re drifting along surrounded by sharks and colorful fish, cast an eye down to the sand and you might find a pair of eyes unobtrusively staring back at you. And maybe it won’t be starring in the next Jaws movie but remember, that’s a shark down there, as perfectly evolved as its super predator cousins. Geez, I need another fix. Time to go and find my camera.